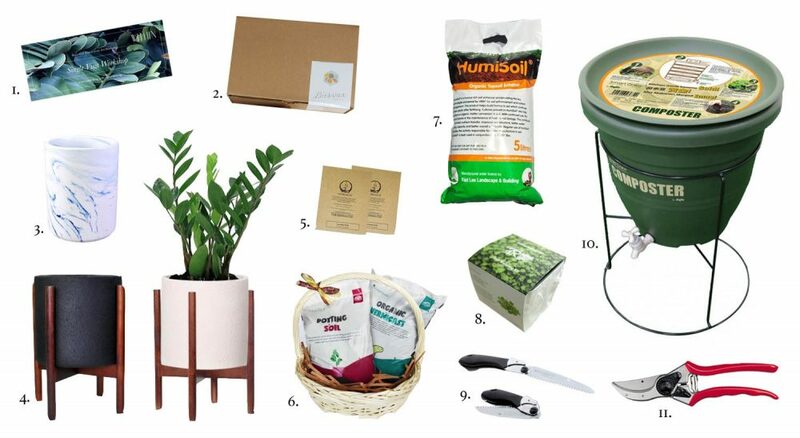 Christmas is coming, and for those who celebrate it, here’s a guide on affordable gifts you can buy for gardeners, or treat yourself! 1.An Urban Farming Kit with a cause. Packed by underprivileged seniors, buying these kits mean that you have given employment opportunities to someone who needs the help. Choose from three vegetable varieties – Chye Sim, Kang Kong and Kailan. Get yours from Super Farmers for $14.90 here. 2. This lovely Polygon Wood Planter looks great in the home or office. Order yours from Candy Floriculture, available here for $18. 3. This elho Aqua Care plant waterer is a considerate gift for the plantlover who travels and cannot find a plantsitter! Available at Far East Flora for $23.90, order yours online here. 4. If you’re shopping for something who loves all things cute and unique, The Misfit Pets is a great, affordable gift. Available at Tumbleweed for $15, get it here. 5. Seeking a smart looking desktop ceramic planter? Look no further, the Chloe Planter also comes in black with a wooden saucer. This is available at Noah Garden Centre for $30. Order yours here. 6. Lovingly handmade in Singapore by Knoette, these Macrame Plant Hangers go for $38 – $42. Get in touch with Joette to own a piece of her artistry! Find her on Instagram here or email her at contact.knoette@gmail.com. 7. My Mushroom Garden grow kit is a fun gift for any age! Mushrooms grow very quickly, and these will sprout within 8 days. Available from Mushroom Kingdom for $17.90, buy it here. 8. This one’s for the zero waster who wants to avoid the use of plastic wrap for their produce and other food in their kitchen. This DIY Beeswax Wrap Kit comes with all the materials you need to make 6 beeswax wraps. This has been put together by Agy Textile Artist & The Tender Gardener (yes I’m plugging myself! ), available at my Facebook shop for $49. 9. Looking for something easy to grow? Edible Garden City has just the thing! Here’s a microgreens kit that is manageable for even the most inexperienced grower. Get your Spicy Mix Microgreens Seed Kit here for $14.90. As a gardener or urban farmer, what would you like for Christmas? Please leave your comments below!